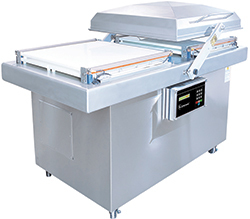 This high-quality, user-friendly, and easy to clean machine integrates heavy-duty parts, thereby providing great reliability. Productivity is increased twofold due to the double chambers that eliminate waiting times. This model is designed to package large volumes of oversized products. The modified atmosphere packaging (MAP) option increases the product's shelf life, provides extra protection, prevents colouring. A variety of pumps are available. 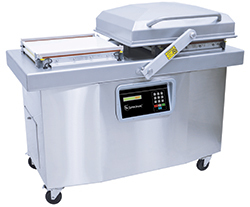 When choosing a double-chamber vacuum packaging machine, it is important you take into consideration the size of your bags and the products to be packaged. A Sipromac expert can help you choose the model that best meets your needs. 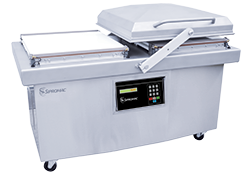 Click on the link below to see the advantages of vacuum packaging in the food sector.